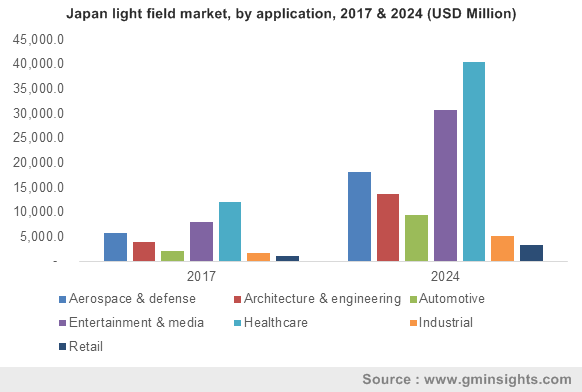 Light Field Market size valued at USD 650 million in 2017 and will grow at a CAGR of over 15% from 2018 to 2024. 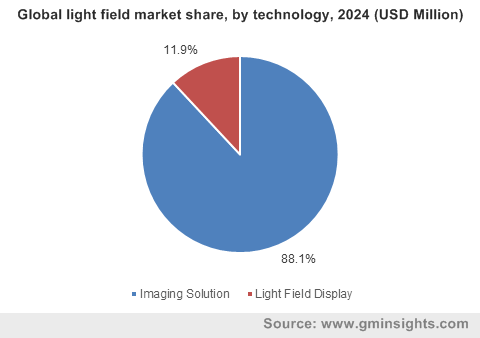 The light field market is expected to grow substantially over the coming years with the rise in adoption of the technology in medical imaging solutions. The imaging technique captures the 3D information of the scene with the use of a single camera and exposure. These advanced techniques can be employed to study & detect the medically problematic areas at micro levels when there are increasing complexities in the detection of several internal health issues. The applications of medical imaging can be witnessed for diagnostic & therapeutic purposes. These technologies have witnessed a very high adoption in medical sectors and hospitals due to the ease offered in the detection of diseases through the body or part scan. The imaging is a more advanced technology that projects the captured image into space, allowing surgeons or doctors to analyze the organ in a 3D view. The growing adoption of the technology in neurosurgery will provide an impetus to the light field market share. The light field market consists of several players that are engaged in incorporating the technology into a diversified range of products. The adoption of the light field cameras in the market is growing rapidly owing to the increased application areas of these products in hospitality, military & defense, and the entertainment industry. With emerging 4D and 5D technologies in the industrial sectors, several business processes are being performed in a more accurate & efficient manner through a clear view and inspection of the operability and functioning of its parts. Other products that are witnessing a high adoption of this technology include displays. Manufacturers are focusing on incorporating light field displays into consumer electronic products such as mobiles, TVs, projectors, wearables, etc. The incorporation of the technology in such devices will allow users to interact with the content through a 3D space, thereby enhancing the user experience. Such factors are anticipated to positively impact the market growth. Imaging solutions are witnessing high adoption rates in the light field market. These solutions accounted for majority of the industry share in 2017. The solutions are being widely used in several sectors for performing careful and important investigations of industrial processes. These processes include infrared & thermal imaging, molecular structure examination, and other medical process examinations & analysis. Complex structures and techniques can be carefully examined by the application of these technologies. The growing demand for such techniques in several industries including chemical, robotics, automobile, and healthcare is anticipated to propel the light field market size. Moreover, these solutions consist of development kits which contain software, hardware, and other support services that allow companies and businesses to develop innovative mixed reality solutions. In the light field market, architecture & engineering segment is expected to grow at a CAGR of around 15% over the forecast timespan. The applications of the technology in architecture & engineering is growing rapidly owing to the rising adoption of the products for 3D rendering, 3D scanning, and 3D modeling. It provides effective solutions to engineers & architects, allowing them to perform their engineering tasks more accurately and efficiently. Earlier, engineers used to analyse the infrastructure component using 2D images, which did not offer accurate results. With technological advancements and innovations in the industry, engineers are now provided with 3D images or models of infrastructure that help them to analyse complex areas, where system failure may happen. Moreover, the manufacturers operating in the light field market are offering high-resolution cameras, which can be refocused after shooting the scene. Such factors are allowing experts to study a specific component or part by obtaining a deeper or enhanced view and find several flaws, which will reduce the maintenance and management costs of the system. 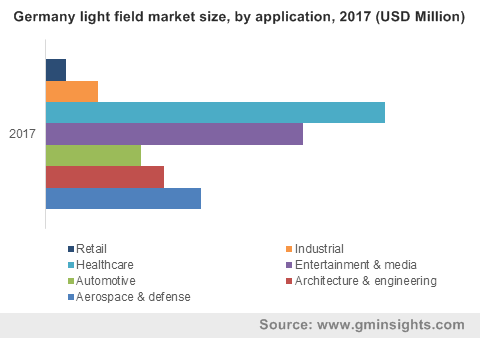 North America light field market accounted for over 55% industry share in 2017 and is witnessing a high adoption of the technology due to growing industrialization and urbanization in this region. Several industrial sectors are planning to incorporate these technologies to modify & simplify their business operations. The U.S. and Canada are experiencing a high adoption rate of such advanced solutions. The strong presence of the global industrial players and their increasing technological advancements & innovations are major factors responsible for such a high adoption. Manufacturers operating in North America are targeting several industrial segments, where applications of the technology are increasing in automotive, industrial, and aerospace sectors. These sectors are partnering with manufacturers to import these advanced solutions for business purposes. Moreover, increased investments in research & development activities by the manufacturers are providing an impetus to the market growth. 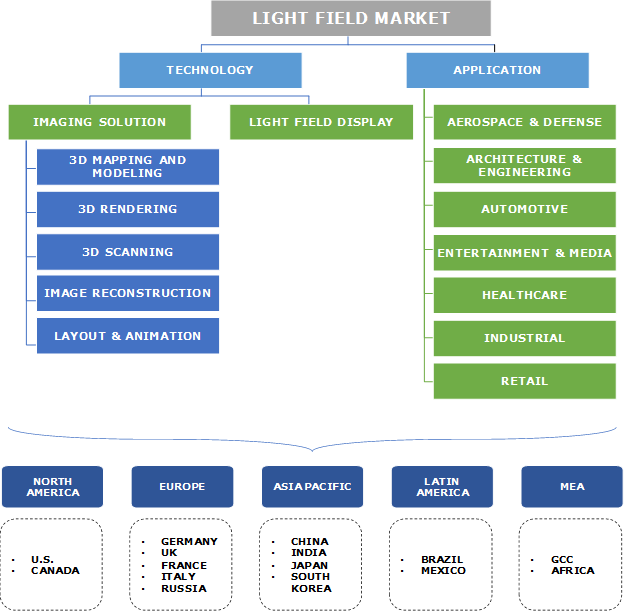 Key players operating in the light field market are FoVi3D, Inc., Raytrix GmbH, Avegant Co., Google LLC, Holografika, Lumii Inc., NVidia Corporation, OTOY Inc., Panasonic Corporation Japan Display, Inc., Leia, Inc., Samsung Display Co. Ltd., Light Field Lab, Inc., Ricoh Innovations Corporation, Sony Corporation and Toshiba Corporation, among others. These players are developing advanced imaging solutions and displays that are developed based on specific application requirements. Moreover, the market is driven by continuous technological advancements and innovations. Companies are investing heavily in R&D to gain a competitive edge and differentiate their products. They are also partnering with other industry players to develop innovative products. For instance, in October 2018, Light Field Lab, Inc. partnered with OTOY to depict a virtual reality space, Holodeck in the movie Star Trek. Light Field Lab, Inc. develops holographic displays, whereas OTOY makes software tools that can be utilized to facilitate realistic digital films. In the light field market, players are engaged in incorporating the innovative technology into their products. As the market is in the research stage and several research institutes are studying to implement the technology in several products, there exists a wide scope for the new players to partner with these research centers and develop innovative solutions that will help these players to attract a wider customer base. The high availability of electronic components and technologies from the suppliers will support the development & research tasks of these companies. Moreover, the buyers in the market are limited in number due to the high adoption of the traditional technology in the industry.